What do you do when you’re craving something chocolaty, but you just want something little, nothing too big? You head to the kitchen and make these tasty bite-size gluten free dairy free brownies. They’re tiny, but full of rich chocolate flavour. Your craving will be fixed up in no time! Baked goods and bakeries happen to be two of my weaknesses. Take a look around my website and my love for baked things will become apparent quickly. So any time I come across something that successfully combines some of my favourite things, it’s likely to be a hit with me. 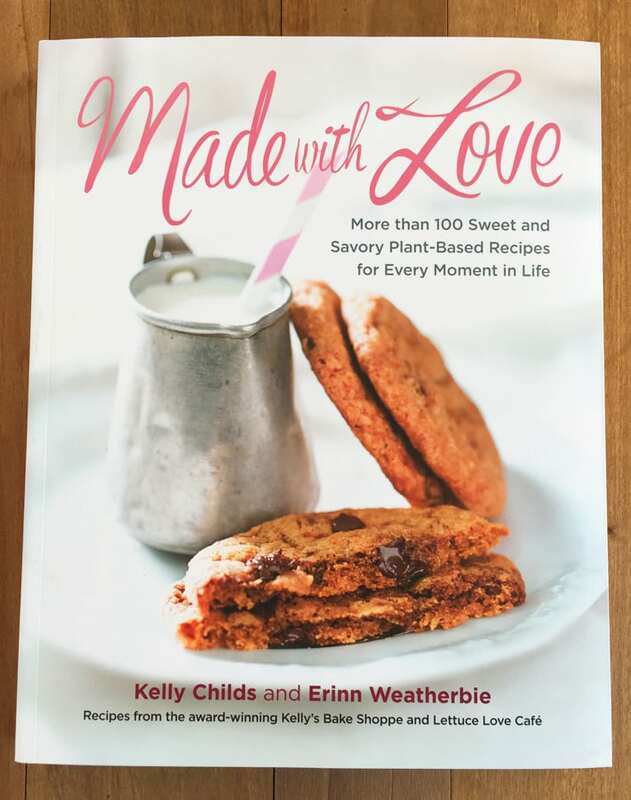 Enter the Made with Love Cookbook by Kelly Childs and Erinn Weatherbie. The authors are a mother daughter team and they also happen to own Kelly’s Bake Shoppe in Burlington, Ontario. At their shoppe, they only bake and sell gluten free vegan treats. A wonderland for those on a special diet or those with allergies. I’ve never been to their bakery (or Burlington!) but if the opportunity ever comes up, visiting Kelly’s Bake Shoppe is going to be at the top of the list. Look at how cute their shoppe is! I learned about this book in a roundabout way. Someone followed me on Instagram so I was scrolling through their feed to see the types of things they posted and came across a picture of a gorgeous cupcake. Of course, I clicked on it and it led back to the Kelly’s Bake Shoppe Instagram account. Through their account, I learned they were releasing a book soon. And here we are, making these easy vegan brownies from the book! The book is gorgeous, the images are beautifully shot, and the recipes! Oh, the recipes. There are over 100 of them in this book and it’s not just about vegan gluten free sweets. 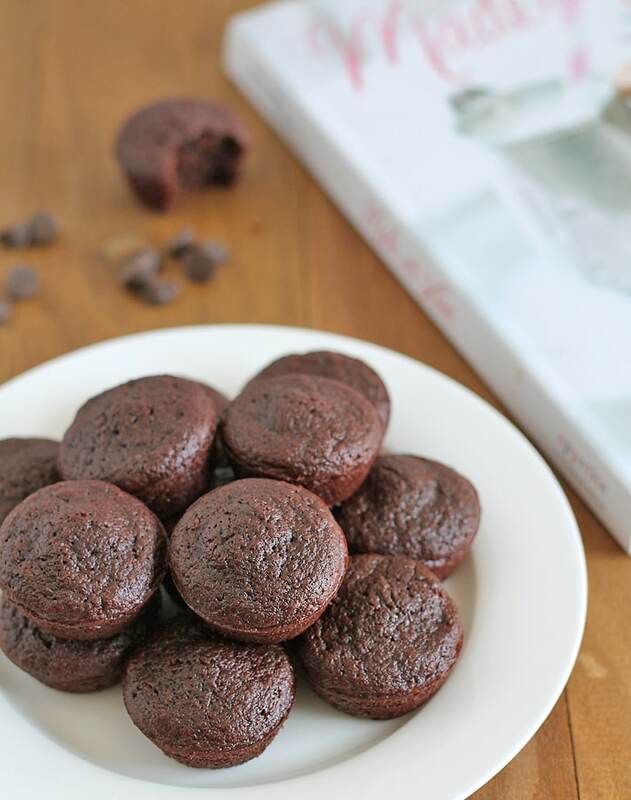 Yes, you will find recipes for cookies, cupcakes, cakes, doughnuts, these gluten free chocolate brownies, and more. BUT, you will also get savoury vegan gluten free recipes for stuff like chili, lasagna, soups, salads, smoothies and lots more! 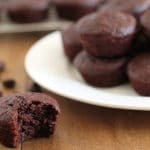 So far, I’ve tried the recipe for the gluten free brownie bites (which I am sharing here with you), and the Sweet Potato & Quinoa Burgers. Those burgers? So good. Thumbs up all around my table, even from the kids. I’m actually making them again this weekend, they were that good. I love brownies. So naturally, I gravitated towards trying this gluten free dairy free brownies recipe first. 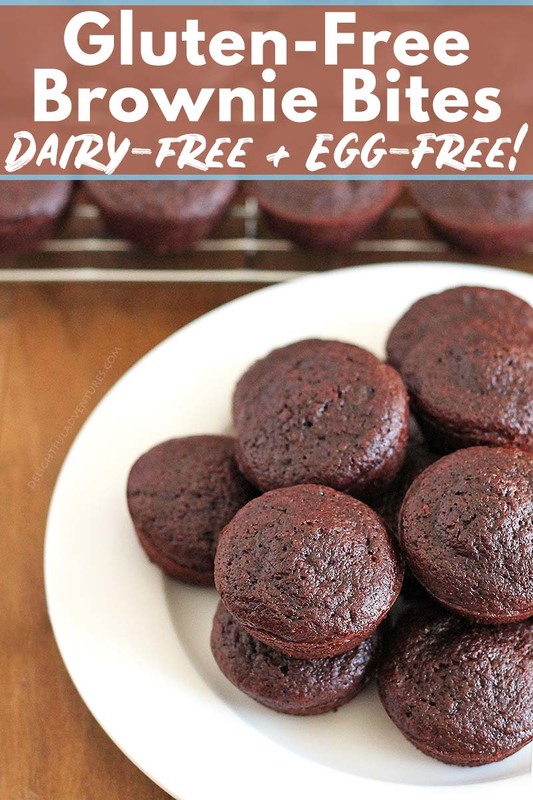 This recipe, like all the recipes in the book, are egg free, dairy free, gluten free, and wheat free. The picture of the brownie in the book looks more dense than how mine turned out but that could be for a variety of reasons. The recipe said to bake for 10 minutes and to not over bake. I took them out of the oven after 10 minutes exactly, but they ended up more cakey than fudgy. It was totally fine though, because they still turned out DELICIOUS and everyone loved them. Cakey brownies are just as yummy! 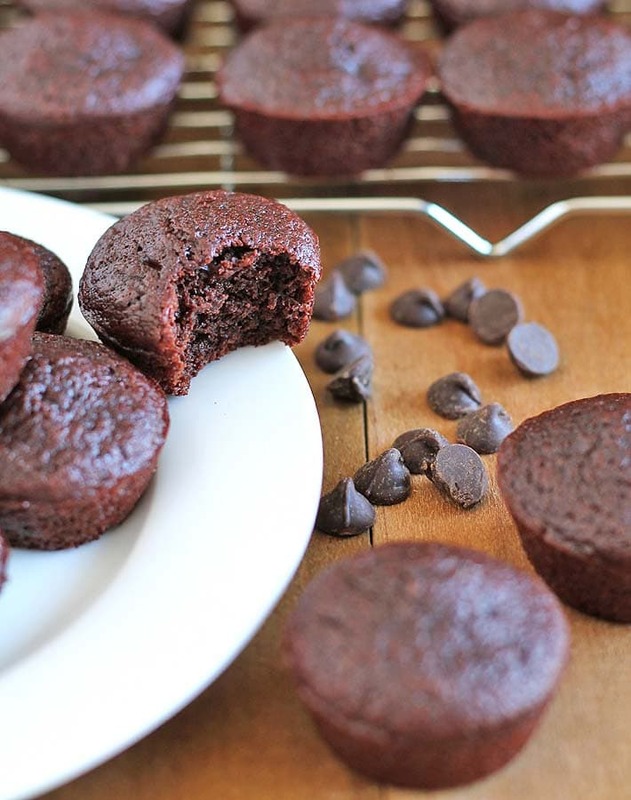 Chocolaty and soft with little bursts of chocolate chips. Yum. What Brand of Gluten Free Flour Should I Use? Every gluten free flour brand produces a different blend. All of these blends contain different ingredients and ratios of those ingredients. Some blends contain xanthan gum, some don’t. Long story short, all blends are different and to get the same results as in the book, we would need to know the exact brand being used. There could be a variety of reasons why the brand was not shared in this book, but either way, keep that in mind when trying out the recipes. I used the Bob’s Red Mill Gluten free All Purpose Blend (with the red label, not the blue) for this recipe and ended up with great results. If you don’t have access to this brand, note that the recipe calls for xanthan gum. So if your blend already has it, omit that ingredient when making the recipe. So would I recommend this book? Absolutely. If you are vegan or gluten-free or vegan AND gluten free, if you have food allergies, or if you’re trying to eat healthier, then get it. But keep in mind what I said above about the flour for the recipes. There are so many ideas in the book for everything from breakfast to dessert and everything in between. There’s something for everyone. If you buy the book, or check it out online, come back and tell me which recipe, other than these dairy free brownies, you want to try first! You can also help me to help others find this gf brownies recipe by pinning it to your recipe board on Pinterest! You can do that by clicking here. What do you do when you're craving something sweet but you just want a little treat? 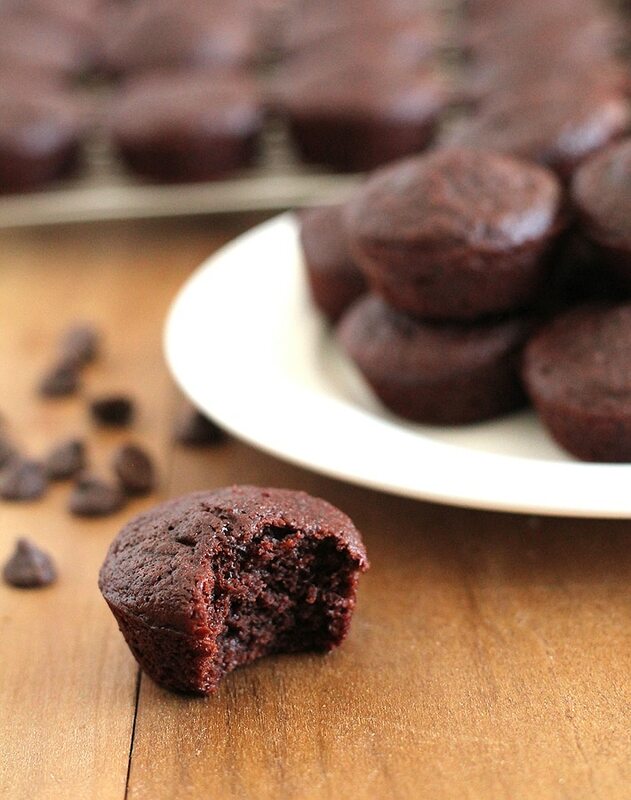 You make these delicious, bite-size gluten free dairy free brownies! Preheat the oven to 350° F (177° C). 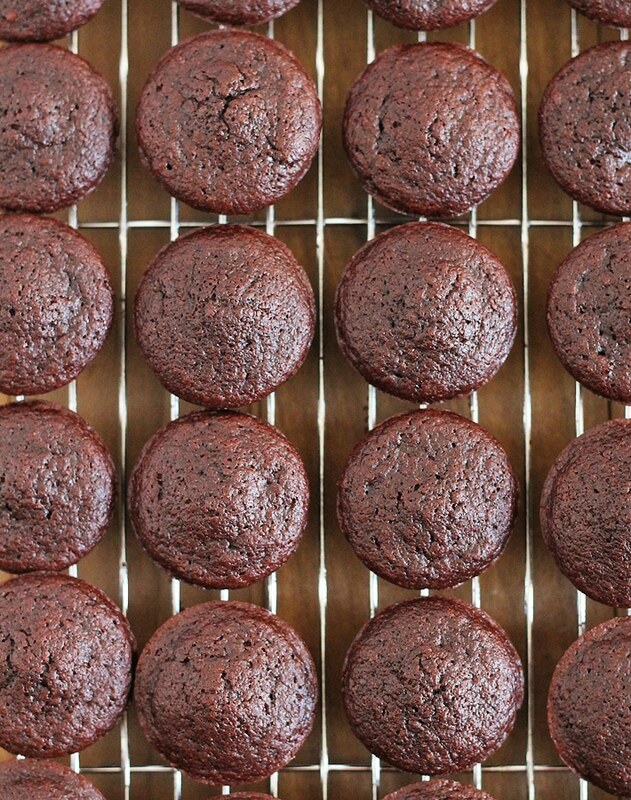 Spray mini muffin pans with cooking spray or line with mini cupcake liners. In a small bowl, combine the ground flax seed with the 3 tablespoons of water and set aside to thicken. In a medium bowl, mix together the flour, cocoa powder, sugar, sucanat, potato starch arrowroot starch, baking powder, salt, xanthan gum and baking soda. In a small bowl, combine the flax mixture, coconut oil, applesauce, hot coffee and vanilla. Stir until smooth. Using a rubber spatula, gently fold in the flax seed mixture until fully incorporated. Stir in the chocolate chips. Using a small ice-cream scoop or tablespoon, scoop the batter into the prepared mini muffin cups. Bake the brownies in the center of the oven for 10 minutes, or until they have firm edges and soft centers. Don't overbake! Let the brownies cool a little in the pan for 10 minutes before serving; they are best served warm topped with chocolate ganache. This recipe says that you will get 36-40 bite-size brownies from this recipe, but I got 48. No complaints though! (I only filled each cup 3/4 of the way up.) Store any uneaten brownies in a sealed container in the freezer to keep them fresh, but not the fridge because that will dry them out. Be sure that you are using potato starch and NOT potato flour. Coconut sugar or brown sugar can be used in place of sucanat. Nutrition info is based on 1 muffin. I used coconut oil, Bob's Red Mill All Purpose Gluten Free Flour, and I did not make the optional ganache. Nutrition info below is only to be used as a rough guide. Click to learn how nutrition info is calculated on this website. Penguin Random House Canada sent me a copy of Made with Love at no charge with the option to share a recipe from the book on my site if I wanted to. Of course I did because the book and recipes are excellent! All opinions about the book and recipes are my own. All images in this post are also my own. Recipe reprinted with permission from Penguin Random House. Could I also use regular flour if I don’t need them to be GF, and leave out the xanthan gum? And what about the starches, are they for GF baking as well? If not, could I use corn starch instead? Hi Cathy, I haven’t made this recipe using the substitutions you have asked about, so I can’t say for sure if things would work out. And yes, the starches are present because it’s a gf recipe, they are part of the replacement for regular flour. Sorry, I know that is not very helpful but if you do decide to give it a try, let me know how things go!